When it comes to raising children, it’s difficult to know which products are best and the most safe. One look at the ingredients on a bottle of baby wash or shampoo and your head will spin from the unpronounceable long list of names. Many self-care and home products are loaded with chemicals known as endocrine disruptors, components that can interfere with the body’s natural hormones and do lasting damage. Avoiding these chemicals should be a top priority, especially for the safety of small children. Endocrine disruptors, or EDCs, can increase or decrease the production of certain hormones, interfere with hormone signaling, bind to hormones, or imitate them. 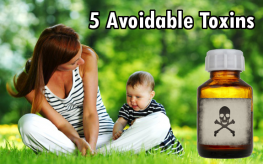 The Environmental Working Group has established a “Dirty Dozen” list of EDCs (which can be found here), but here are 5 that you’ll particularly want to be aware of in your baby’s products. Perhaps one of the most widely known EDCs, bisphenol-a (BPA) is found in plastic food containers and even receipts. A synthetic hormone which can imitate estrogen within the body, BPA has been linked to certain types of cancers, obesity, early puberty, and heart disease, and is found in 93% of Americans’ bodies. Phthalates can trigger cell death in testicular cells, bad news for boys. They’ve also been linked to hormone changes, birth defects, obesity, diabetes, lower sperm count, and decreased sperm health. They are largely found in plastic food containers, but can also be listed as “fragrance” in personal care items. PFCs are used in the making of nonstick cookware. They are “completely resistant to biodegeneration” which means they’ll outlast you and I. They’ve been linked to decreased sperm health, kidney disease, low birth weight, and thyroid disorders. Found in cleaning products and cosmetics, glycol ethers can “damage fertility or the unborn child” according to the EU. They’ve been linked to blood abnormalities, lower sperm counts, and even higher asthma and allergy rates in children. One would think flame retardants would be a good thing to have around children as to prevent fires and subsequent damage. But flame retardants found in furniture upholstery, carpeting, and more have been linked to lowered IQ and other significant health effects. Many of these have been phased out over the years, but some Americans are living with older furniture and carpeting still containing flame retardants. When it comes to keeping your children safe from harm, there are countless things a parent must do. But looking out for these endocrine disrupting chemicals is a good place to start.